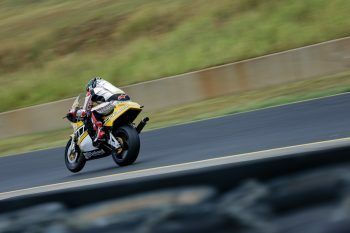 The second most successful rider of the Isle of Man TT John McGuinness has described the Team Winfield-prepared, Harris-framed Yamaha F1 contender as an ‘impressive bit of kit’ after sampling it at Sydney Motorsport Park’s International Festival of Speed (IFos) over the weekend. McGuinness, who has piloted Team Winfield machinery to Classic TT victories in the past, faced a mechanical issue in the opening encounter of the TT Cup before bouncing back for 6-4 results, granting him 10th overall. 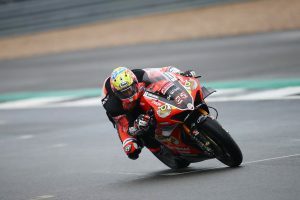 Ongoing rain prompted event organisers to abandon the final two races on Sunday, denying the British motorcycle racing legend of moving up in the classification. 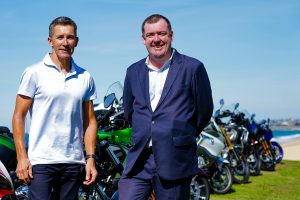 “I’ve ridden for Roger for quite a few years now, he owns Paton that I won the Classic IoM TT on a couple a times,” McGuinness explained to CycleOnline.com.au. “Roger is just enthusiastic – he loves it and puts his heart and soul into it. The bikes are prepared lovely. “At the end of the day, it’s a 1980s touring bike engine – they were designed to go into south of France with your wife on the back – they weren’t designed for racing those engines. Piloting a DMR Motorsport prepared Suzuki XR 69, Paul Bryne went onto lodge a 2-5-1 scorecard throughout the three races hosted during Friday and Saturday to claim TT Cup honours, edging former British champion Glen Richards by two points for the top spot. Former World Superbike and grand prix racer Michael Rutter completed the podium in third ahead of grand prix winner Jeremy McWilliams and Aaron Morris.